Lemon is widespread vegetable and grown all over the world. It contains natural acid called Acetic Acid or Vinegar, Protein, Calcium, Potassium, Magnesium, Dietary Fiber, Copper and 0% Cholesterol. Lemon is a very low cost fruit and it is easily available in market. It has many health benefits; it is rich source of vitamin C that is essential to keep you immune from cough and cold. Lemons contain flavonoids which work against viruses and keep the body fit. 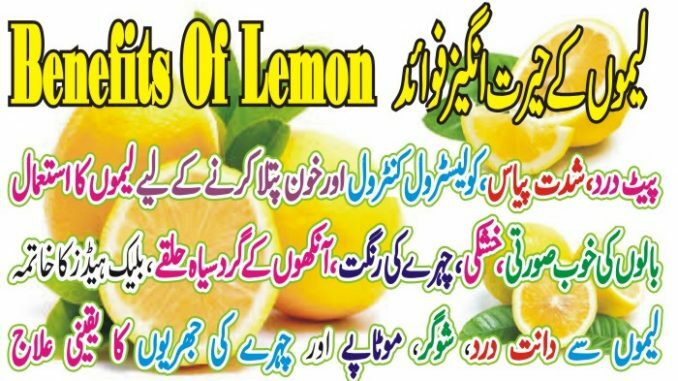 Here I am sharing with you some health benefits of lemon in Urdu. Lemon is very good for losing weight because of its acidic content. Lemon is usually used in form of juice, used in green tea, used as pickles and sauces, used in salads and mix in dishes for lose weight. Green tea mixed with lemon juice is an excellent drink which can be used daily to loose weight. Lemon contain Pectin Fiber that helps in weigh reduction. Lemon help to keep skin in beautiful and healthy condition because lemon is best anti pigmentation agent, when applied locally to skin especially on friction areas like elbows , knees, and knuckles it greatly reduces pigmentation and makes skin color white. In fact it is used in many whitening agents available in markets. Drinking lemon water with honey have many health benefits like good for skin, helps lose weight, energizes the body, removes joints and muscle’s pain, cleans liver, develops antioxidants in the body which protect from certain diseases and yet there are many more. Lemon jism ki garmi ko door karta hai. Maidy aur anttario ko mazoot karta hai. Kabz kusha hai. Heeza, matli aut keh mei mufeed hai. Piyas bujhata hai. Zehreelay janwaroo kay dank par iss ka raas lganay say zeher ka asar zail hojata hai. Dil ki kamzori door karta hai. Masooroon aur dantoo kay dard kay liye aur warm kay liye mufeed hai. Malaria kay bukhar main lemon par pesi hui siyah mirch aur namak laga kar qadray garam kar kay iss ka raas chuseen. Lemon kay raas main tora sa garam pani mila kar hal kar kay gargary kareen say zaban aur moun kay chaly theek hojate hain. Lemon kay juice ko ungliyo par laga kar dantoo par lagaen. Dantoo ka mail door ho jae ga. Dant motio kay manind chamak uthen gay. Agar ap mutapy sai pareshan hain tou lemon ka raas pani mei mila kar din main 2 se 3 baar rozana pian. Iss trah istimaal Karen se. Mutapa door ho jae ga.